Third-party controllers have been usable on iOS in the past but now Apple is introducing specific regulations that developers can follow to ensure their games will work with any Apple-standard controller. Developers will be able to step outside the touchscreen and target games to use. The idea is that once you've bought one controller you'll be able to use it on any game. The news has come as developers have begun playing with the new iOS, which Apple made available in its beta form at WWDC on Monday. 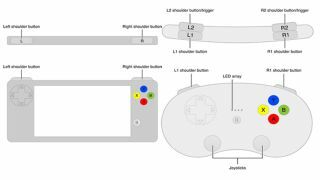 Apple announced iOS 7 support for third-party controllers via a slide during its WWDC keynote which referenced MFI game controllers. But a new image dug up on Apple's developer portal gives us a clearer idea of what it has in mind. And of course, this could apply not only across iPhone and iPad but also to Apple TV via AirPlay mirroring, which could see Apple getting more serious in the home console space too. Apple tells developers, however, that game controllers should be optional and not a requirement, meaning that those without will still be able to jump into a game without the need for peripherals.